The names of the finalists for the 2018 Ballymena Business Excellence Awards have been revealed. 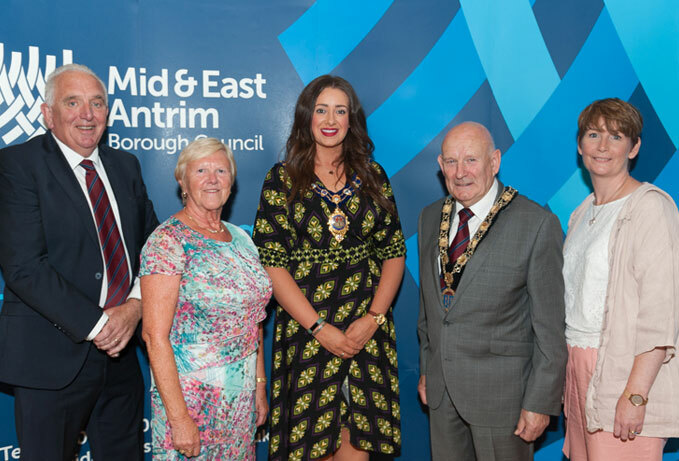 The awards are organised annually by Ballymena Area Chamber of Commerce and Industry and this year the principal sponsor is Mid and East Antrim Borough Council. You can view this year’s finalists by clicking here. L-R: Tom Wiggins (Ballymena Chamber of Commerce and Industry) Cllr. Audrey Wales MBE, Mayor of Mid and East Antrim Borough Council Cllr. Lindsay Millar, Chamber President Alderman Robin Cherry MBE and Catherine Scott, (Insight Mystery Shopping). Tom Wiggins, Chamber of Commerce Business Awards Manager said that the entries reached record levels this year. Tom said “To ensure the integrity of the awards the judging is carried out by Insight Mystery Shopping from Belfast. The Chamber is not involved in the judging in any way. The judges this year were hugely impressed not only by the number of entries but the exceptionally high quality. “The gala evening will be held in Tullyglass House Hotel on Thursday 18th October. The compere for the evening will be Liam Beckett and the after dinner entertainment will be provided by The Manouche Boys. Magician Rodd Hogg will also be entertaining guests during the evening. I am looking forward to another excellent evening. Tickets are selling well for what is now the leading event in the Ballymena business calendar. I would like to congratulate all the finalists and wish them good luck for the gala evening when the winners are announced”. To purchase tickets, or for more information please contact Tom Wiggins at office@ballymenachamber.co.uk or on 07801 738359.